We do not automatically print statements for a deceased person, because we thought it might be upsetting for our members to receive mail from their church addressed to the couple…sometimes months after the spouse had died. So, we handle those statements on an individual basis. There are just a few special things you will need to do for those in your congregation who have passed away during the year (or during the date range that you are using for your statements). Save the search. You will use this same search each year, just changing the Deceased Date. Go to the person’s Giving > Statements tab. Click on the Year for the statement you need to print. This will generate an Individual Statement for the deceased person and one for the surviving spouse. Send both statements to the surviving spouse. If they file joint income tax, they will just use both statements to get the total giving for the couple. 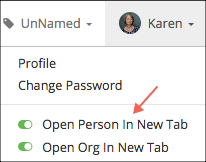 Be sure to turn on the option to Open Person in New Tab , so that you can easily move back and forth between Search Builder and each people record. This is located under your profile in the header. Continue as above for each person in your search results. If you go to the record for the surviving spouse and print a statement, it will be only for that person. It will not print the statement for the deceased person. You do not need to print a joint statement for a couple with a deceased spouse. The 2 individual statements are all that the surviving spouse will need. However, if you are requested to do that by a surviving spouse, here’s what you will need to do. Remove the Deceased Date ,making sure you note the date so you can re-enter it. Remove the check beside the Do Not Mail flag. Verify that the Statement Type is Joint , either on the Profile > Member tab or the Giving > Statements tab. If not, change it to Joint . Change the Statement Type to Joint , either on the Profile > Member tab or the Giving > Statements tab. Print the Statement from either spouse’s record. Once you print the statements, go back and re-enter the Deceased Date , check the Do Not Mail box for the deceased person and change the Marital Status back to Widow for the surviving spouse.